Blinds & Drapes in Farmington Hills | Commercial Blinds & Drapes, Inc.
Add character to your home with window treatments from Commercial Blinds & Drapes Inc. of Farmington Hills, MI. 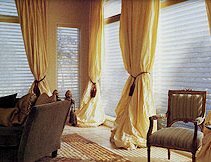 With 35 years of experience, we specialize in both commercial and residential blinds and drapes. Whether you live in state or out of state, we’ll provide you with personal and professional service to help you find the right window treatments for your home or business. Hunter Douglas, Kathy Ireland, Kensington, Graber, Norman Shutters, B&W, Kirsch, Comfortex, and Phifer SheerWeave. Blind and drapery repairs – even on products we don’t sell!